Cooler for biomass pellets: Counter flow type. Cooler Function: To reduce the temperature and moisture content of newly produced pellets to the required temperature. 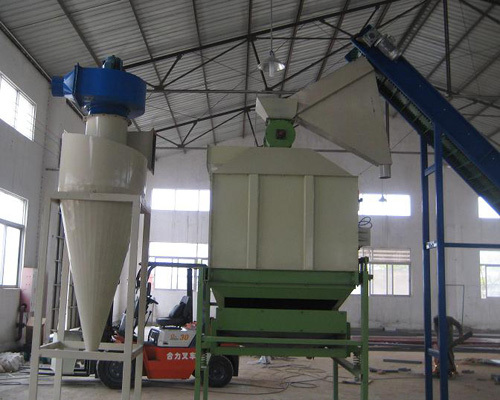 If this machine is not used, the pellets may break apart. How does the counter flow cooler work? The airflow is opposite to the direction of flow of pellets, blowing air through columns of hot & moist pellets, which results in evaporation of moisture from the pellets. To achieve the required cooling effect, pressure and volumetric flow rate of air, length of column and the residence time will play an important role. It consists of intake air lock, cooling chamber, grid gate, blower, pipeline and cyclone assembly. 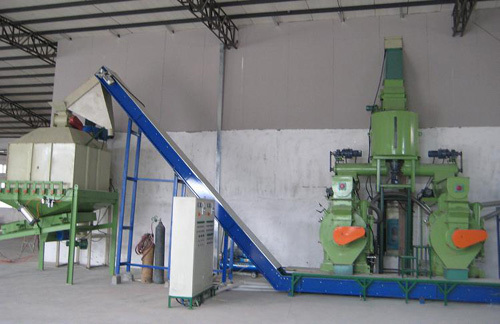 The temperature of the biomass pellet from the pelletizer is 60-85centigrade; the cooling pellets would be 3 to 5 centigrade lower than the room temperature. The moisture will be removed by 3 to 5%. The pellet cooler have the function of discharge automatically, which avoid feeds from cross contamination. 4. The series counter flow coolers can match with secondary volute separator for combination use.